Skeptics will sometimes label a person knowledgeable about many disparate subjects as a "jack of all trades and master of none." Having mastered such diverse fields as business, science and law, Tin-Chuen Yeung '87 is a living rejoinder to that expression. Call him a Renaissance man. 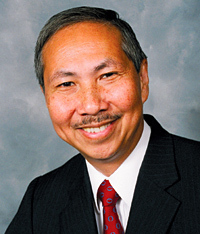 In addition to his Kellogg School MBA, Yeung holds a doctorate in pharmacology and a bachelor of science in biochemistry from the State University of New York. He worked as a scientist for eight years, three of which he spent as a research fellow at Harvard University, and, with an American partner, delivered a series of lectures to the China Pharmaceutical Association in August. He has been a high-ranking executive at Baxter International and Bell, Boyd & Lloyd. The Northbrook, Ill.-based law firm of which he is managing director, Everest Intellectual Property Law Group, was profiled in the Chicago Daily Law Bulletin in January. Yeung himself was profiled in The Scientist and co-authored an article on venture capital in American Venture in 2005. "What I was trying to do was combine my science training with my business training and create my own niche," he says. Almost as an afterthought, Yeung mentions he passed the patent examination without ever attending law school. "My combination of experience has served me very well," he notes. Of course, there have been humbling moments. As an undergraduate at SUNY-Stony Brook, where he had traveled from Hong Kong on scholarship to study biochemistry, Yeung says he was not quite so connected to his new environment. "I was so involved with the Chinese community that I didn't know what was going on in America," he says, recalling a sidewalk encounter with a fellow Stony Brook student who wanted to know if Yeung could tell him who had won the SuperBowl. Puzzled, Yeung asked, "What's the SuperBowl?" Though he laughs about the exchange today, the moment was crucial to Yeung's professional development. Realizing how little he knew about the lives of the people among whom he hoped to build a life and career, he decided to immerse himself in American culture, studying it as enthusiastically as he had been studying math and science. Since then, the United States has truly become Yeung's home. For the past 10 years, he has lived with his family in Northbrook, where his company is also located. Everest IP boasts clients ranging from major universities to multi-billion-dollar companies all over the world. Yeung, managing partner Joseph Fuchs and partner Michael Leonard have decades of combined experience in law and related fields. They claim among their many areas of expertise biotechnology, information technology, material sciences, Internet technology, bioinformatics and computer software and hardware. "Between the three of us," says Yeung, "we can handle pretty much anything." Yeung says his time at Kellogg has been an important piece of his professional development throughout his career. "Kellogg really emphasized cash flow analysis," he recalls, which endeared him right away to the board of directors at The NutraSweet Co. during the three years he spent in the company's business development division. As he was about to begin his first presentation, Yeung says impatient board members demanded to know why he, originally a pharmacologist in research and development for the company, was qualified to give a business presentation. Startled, Yeung began to list qualifications. The board stopped him when he said he has a Kellogg degree, apparently sorry to have doubted. "I learned two major things from Kellogg," says Yeung. The first was the importance of examining every facet of a problem with a manager's critical eye. The second, he continues, was how best to share that skill with prospective employers. "You have to market yourself," he says. "You have to market your services. Why is your skill so important to future employers? If there's no answer, you shouldn't be in business."